Having a new garbage disposal installed by a local plumbing company will benefit you, your family, and even the environment. While you might be aware of a few reasons to consider having a new one installed in your kitchen, here are the top 10 reasons to have a garbage disposal installed today. When you dump food scraps in the kitchen garbage, those bags fill up much more frequently. Using the garbage disposal means less trash and less need for new expensive plastic bags. While you may be nose blind to the odors from that rotting food in the trash can in the kitchen, it is in fact causing the air quality to diminish. Anyone walking in your home will instantly smell those odors. Clearing off each plate and dish in the trash is time consuming after every meal. The garbage disposal frees up that time by letting you rinse everything and then wash in the same place. When you put that food in the kitchen garbage, you invite rodents and insects inside the home to get a meal. Once it goes down the drain, it is out of the house instantly. If you are throwing away food rather than putting it in the garbage disposal, outdoor critters will be trying to get in those trash cans at night. A cleaner can means less raccoons, bears, cats, or dogs trying to tip over the trash. When you utilize the garbage disposal, you send less trash to your local landfill. Every year you could be saving hundreds of pounds of trash from piling up at the landfill. As the food decomposes at the landfill, it emits carbon monoxide. The less trash means the less carbon monoxide per household. 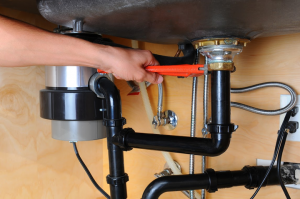 The garbage disposal liquefies all that food and sends it down the drain, helping to eliminate any clogs in the pipes. When the garbage trucks pick up less trash per household, they use less fuels to do so. This can help keep you taxes from increasing each year. When you buy the best quality garbage disposal today, you will certainly recover your money when you sell your home. Any buyer will gladly welcome having a disposal already installed as part of the house package. Smelling a stink in the sink of your Annapolis home? That means you need a garbage disposal. Call Heidler Plumbing at (410) 268-7191, and have an expert install one today!